You don’t die from the pain, you die from the damage the disease does to your body. The nervous, lymphatic, immune, and every organ are in the path of this progressive incurable disease. 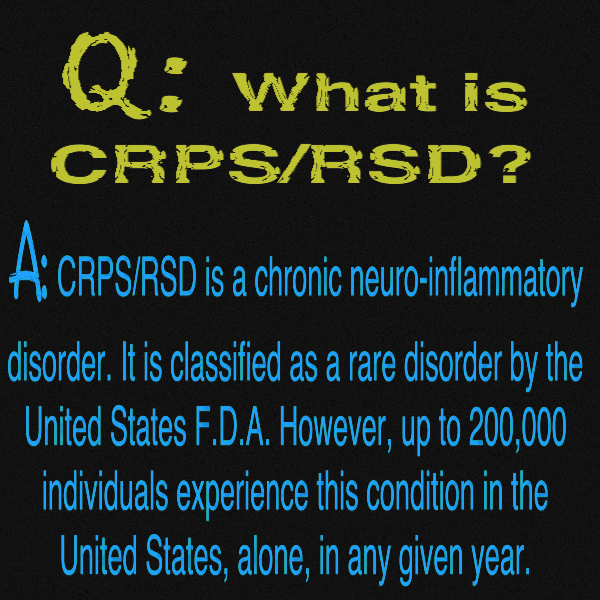 From the worst pain known to modern medicine, to muscle atrophy and organ failure, this disease doesn’t discriminate. It does care about your age, children do get CRPS/RSD. Women more than men get it but men do get it just as they can and do get breast cancer. Awareness is needed to bring a cure and better treatments faster to the USA. While some are able others struggle to go to Italy for their hail mary treatment. Others can’t and access to human trials is limited. I have found none accepting type 2 patients, only type 1 in my area. It’s worth it to be able to look or even take part, perhaps it leads to something better down the road. Treatments that work, things to help make life more bearable. Let’s get rid of the nickname that creates such fear, and leaves such horror in it’s wake, “the suicide disease”. To many of us are diagnosed beyond the reversal or remission point, doctors read a paragraph about us and little more unless they happen on a patient with it. Then the doctor and the patient learn together and deal with this life changing illness. We don’t have a rich champion out there raising awareness for us, we need one, but until then all we can do is share our stories. Share the stories of those we love, and those we have loved and lost. November is drawing to an end, but #CRPS awareness needs to happen every month. HOPE is a beautiful four letter word, I have it, may you also.